Whole30 meal planning and prepping is no joke. When you’re doing a Whole30 it’s also not optional, either. After doing it long enough, I’ve found there’s a few things I do now that have helped me get it done faster, easier, and with less stress. These 6 Whole30 meal prepping hacks are things I don’t think enough of us are thinking about when we’re coming up with our meal plans, and they definitely weren’t things I was doing when I first started! 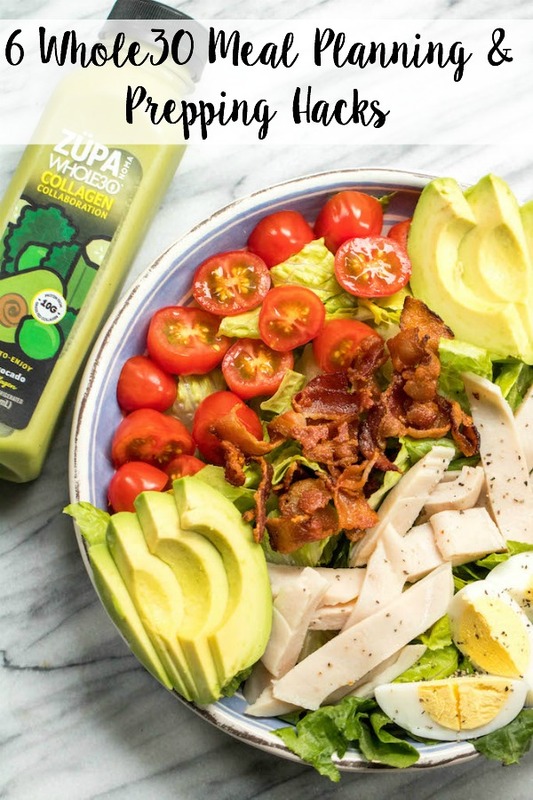 This post is in partnership with my friends and Whole30 Approved partners ZÜPA NOMA! I’m happy to work with a company I love, use and believe in! Save 15% off your order using the code “WHOLEKITCHENSINK” at checkout. Thanks for your support here on the blog, and for ZÜPA NOMA! I hope that with these tips and tricks, you’re able to lighten your meal planning and prepping load, spend less time in the kitchen, and more time doing what you love! 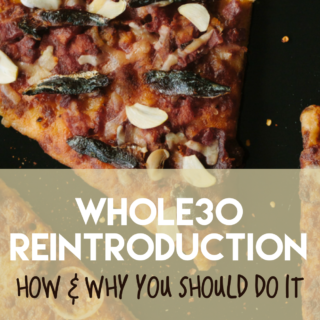 We’re lucky we live in a Whole30 world where we have healthy, Whole30 options that save us time. I save SO MUCH TIME planning ZÜPA NOMA Whole30 Approved, Certified Organic soups into my meal plan. Not only in the planning part, but in the actual *eating* part. When I know I’m going to have an especially busy morning, or will be away from my usual routine for lunch, I just plan to have a ZÜPA NOMA soup with me, an easy protein and that’s that. No rushing to get out the door because breakfast took forever, no hoping there’s something compliant at the meeting I have to go to that’s scheduled over my usual lunch time. By planning these into my meal plan for the week when I know I’ll need that time, I’m also reducing the dishes I’ll need to wash and the time I’ll need to spend prepping. 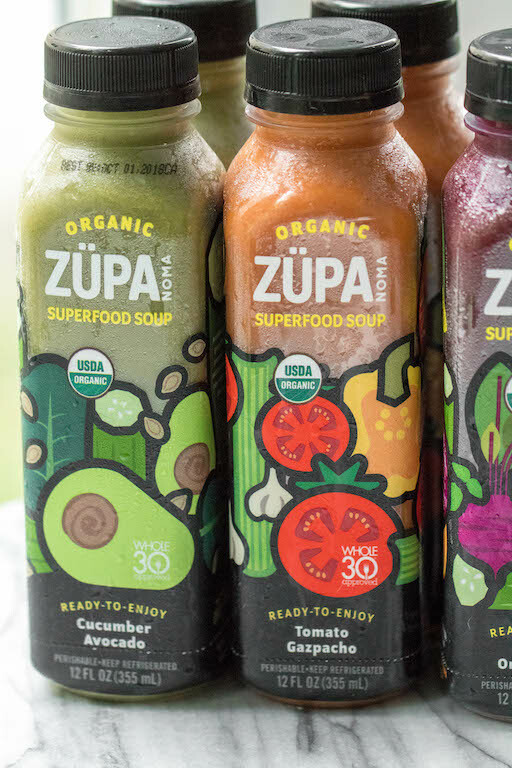 ZÜPA NOMA are ready-to-go portable soups that use the entire vegetable, leaving all of the fiber and nutrients and keeping me (and you) fuller! They’re easy to grab when you’re heading out the door to appointments, running errands and one of my personal favorite uses, on the way to the grocery store! With how busy all of us are, some days it’s really nice not to have to stop to make a Whole30 mini meal before you need to be somewhere. They’re always coming in so handy, and because of that I make sure that I plan them into my busy days. 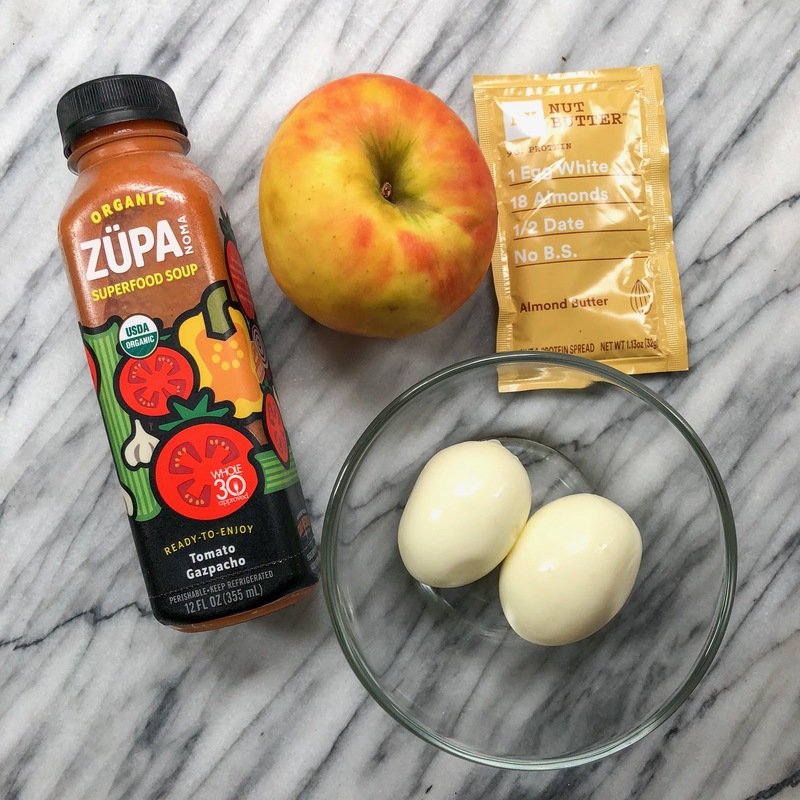 To save 15% off of your ZÜPA NOMA order, use the code WHOLEKITCHENSINK at checkout! These are a game changer for life on the go! This is something I started doing to help create a routine for my little family after hearing how well it was working for my friend’s larger family. I’ve now been doing it long enough to know that it can majorly help a household of any size. The idea is that a few nights of the week you have a designated theme for dinners. Monday could be soup night, Wednesday is slow cooker night, Thursday is breakfast for dinner, Friday is taco night, Sunday is grilling. You get the idea. My family does a slow cooker meal Monday, sheet pan Wednesday, grills on Saturday! 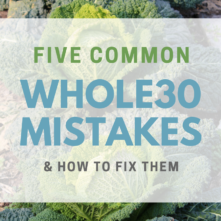 The reason this is helpful for Whole30 meal planning is because it cuts down on decision fatigue. It can be utterly exhausting to have all of these extra decisions to be made when you’re on a Whole30, on top of our hectic every day life decisions. These themed nights can be something your whole family will end up in a routine with, you can change up what type of soup or what type of fish on fish night or what type of slow cooker meal of course, but it still allows you to make quick recipe decisions. It’s okay to go with family favorites. 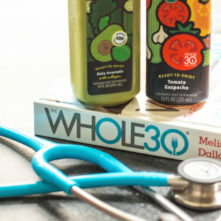 Overcomplicating Whole30 meal planning leads to a miserable meal prepping experience. So often we get so excited about all of the new things we can make or want to make, that we end up putting so many new recipes on our meal plan each week. Cooking something you don’t know how to cook 5 nights a week for dinner, and for meal prep on Sunday for breakfasts and lunches is A LOT of work. It just is. And it’s going to get tiring really quickly. Sometimes you just want to come home and not have to look at a recipe, not have to learn a new way of doing something when it’s 5:30pm and you’re starving, and, well, what if you don’t really like the new recipes you made for meal prep but you’re stuck with all of them all week? My general rule of thumb here for Whole30 meal planning and meal prepping is to only make 1 or 2 (at the most) recipes that are new to you and your family. The rest should be family favorites, staples you already know you love, or ingredient meals like roasted chicken marinated in a Whole30 sauce that you can pair with crispy potatoes and green beans. Many of us (myself included) have a pretty decent freezer stash of meats, frozen veggies or freezer meals you’ve made in the past. I know for me, I buy meat when it’s on sale, often a few extra pounds of whatever it is so that I’m saving myself time and money later down the road. But, we’re only saving time and money if we’re using them down the road, not just buying more, right? Right! 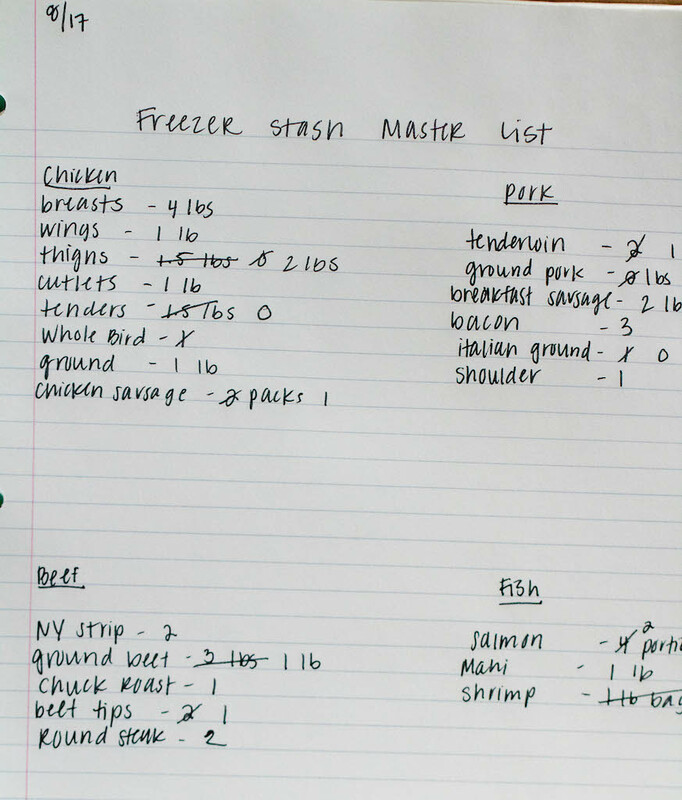 Take a few minutes to either make a master list of what you’ve got stored up so you can look at it before making your meal plan, or spend a few minutes digging out some ground beef, chicken thighs or steaks you forgot were in the freezer and plan from there! 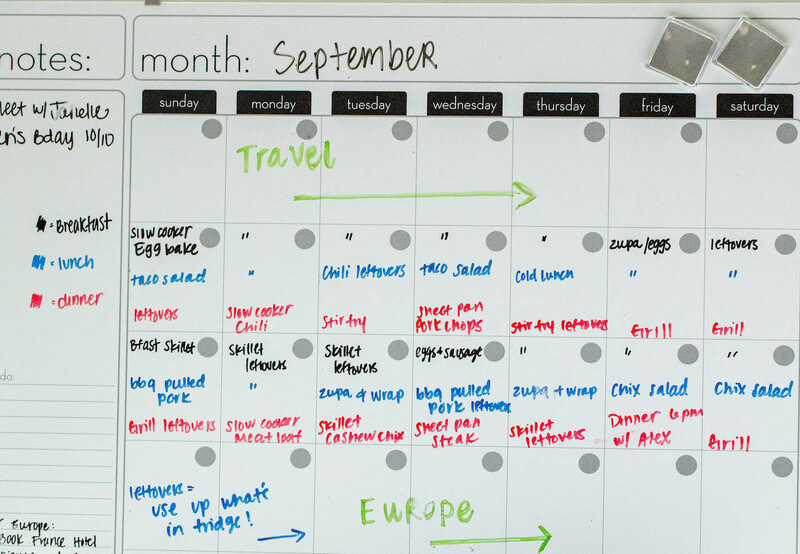 Instead of writing out a meal plan, finding a bunch of recipes we’re going to make and then creating a shopping list, it’s more helpful to base your meal plan, recipe search and shopping list around what you’ve already got. This is also a recipe finding hack as well. Knowing you have ground beef and chicken thighs will give you some sort of direction in your recipe search or meal idea brainstorm – narrowing down your Whole30 meal planning options so you can get it done quicker! Note: This same idea applies to vegetables or pantry items too. If you have romaine that needs to get used up going into your next meal prepping session, or you have baby tomatoes about to go bad, you can use that information to guide your recipe search and make taco salads! Therefore cutting down on the produce you’ll have to buy, and the produce you could potentially waste. This might sound obvious, but it’s something we forget to do a lot. That tends to leave us either starving in an emergency without any Whole30 snacks, or scrambling to get something together the day of our workout when we’re supposed to be at that class in 15 minutes. It’s worth the effort to think about this, and add it into your meal planning. It only takes a few extra minutes and it pays off big time during a stressful week. And, as experience will teach all of us, at some point your meal plan or meal prep will go awry. What you have on hand for a quick and easy meal during those times is crucial! The ways I do this is by portioning out cashews, making sure I have enough apples to use as snacks, keeping meat sticks and nuts in places I may need them (like my car, purse, boyfriends car, dad’s house). I also make sure I know what my workout plan is in the first place so I can adequately prepare for them. For my pre-workout meals I’ll just write it into my plan to have my ZÜPA NOMA portable veggie soup and a meat stick on the way to the gym or workout class. I also make sure to include them on travel days, days when I’ll be away from home long periods of time, or on days when I think I could be late getting home. I know those days I can struggle getting veggies in, and I can’t survive off of just nuts and meat sticks. I mean, I probably could, but ZÜPA NOMA veggie soups just make me feel better, and make sure that I’m upping my veggie intake. All of which I’m a fan of. Failing to plan is planning to fail, ya know?! 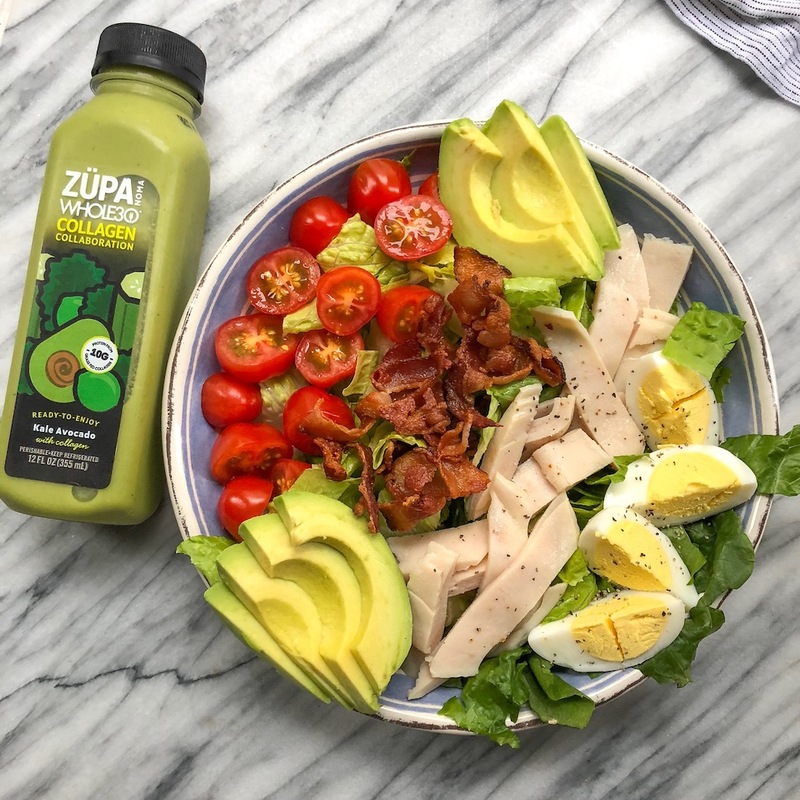 Click HERE to order my favorite Whole30 Approved ZÜPA NOMA flavors! Use the code “WHOLEKITCHENSINK” to save 15%! What I mean by this is that you should be utilizing everything in your kitchen that cooks food when you’re both planning and meal prepping. Just like you’d take inventory of your foods before you begin to plan what to make, you should take inventory of the appliances you have to make said food. Do you have an oven? A slow cooker? An Instant Pot? An air fryer? A skillet? All of them? Good! Use them! Plan the recipes you’re going to make on your meal prep days so that you can use all of available cooking methods at the same time to get your recipes made, and therefore cut down on the time you’re spending making them. Making 2 sheet pan meals, or two slow cooker meals sounds great in theory when you’re finding recipes on Pinterest, but in practice, those two sheet pan or slow cooker recipes will double the time needed to make them as opposed to using the oven for a sheet pan meal at the same time as using the slow cooker. Start with the appliance that takes the longest to cook and get it going first, then move onto the appliance that takes the second longest time, until you get to the one that cooks food the fastest. By the time they’re all done, you’ll have your 3 or 4 recipes done! Ideally in under an hour cook time (excluding the slow cooker). Get a roast going in the slow cooker with potatoes and carrots while the oven is preheating. Then put a sheet pan recipe in or my veggies I’m going to roast for this week both with a cook time of about 40 minutes. Once that’s in the oven, I start my instant pot chili which takes 35 minutes. From there I can get a 30 minute skillet recipe going, which usually is a stir fry! By the time that stir fry skillet is done, so is my instant pot, and so is the sheet pan. It’s about working smarter in the kitchen, not harder! I hope these tips and tricks that I use and have found success with help make your Whole30 meal planning and prepping life easier! It’s all about making Whole30 work for you, your family and your life style, not the other way around. Implementing these strategies during my Whole30 ended up helping me continue to eat healthier long, long after the round ended! I’m impressed and you motivate me thanks. I’m so glad – thank you so much!